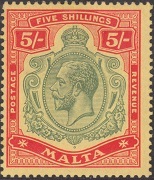 Malta stamps with the portrait of King George V did not appear until almost four years into his reign. Where the issues of King Edward VII were very few, the issues of his son were immense. King George V was an avid stamp collector, having been given an album by one of his uncles, when he was still the young Duke of York. He is personally responsible for what is referred to today as the Royal Stamp Collection. His British Colonial collection is complete, except for the British Guiana 1 Penny Magenta, which he bid on in an auction but did not win. When he died, the Royal Collection was about 75 volumes. It was added onto by both King George V and Queen Elizabeth II, and today, the collection is still maintained by a government curator. As a stamp collector, King George V took personal interest in all the Great Britain and British Colonial stamps issued during his reign. It is written that he was actually involved in the design of some of the postage stamp issues, as well. The ten new stamps shown above were issued between 1914 and 1921. These Malta stamps are all typographed and they are printed on paper with WMK 3 - the Multiple Crown and CA watermark. 1/4 P. (1914 - Scott #49) - Brown. 1/2 P. (1914 - Scott #50) - Green. 1 P. (1914 - Scott #51) - Carmine, Scarlet. 2 P. (1915 - Scott #52) - Gray. 2 1/2 P. (1914 - Scott #53) - Ultramarine. 3 P. (1914 - Scott #54) - Violet on Yellow. 6 P. (1914 - Scott #58) - Dull Violet and Red Violet. 1 S. (1914 - Paper Colored Through - Scott #59) - Black on Green, Black on Blue Green, Black on Olive, Black on Emerald. 1 S. (1915 - Paper Surface Colored - Scott #62) - Black on Green. 2 S. (1914 - Scott #60) - Ultramarine and Dull Violet on Blue. 5 S. (1914 - Scott #61) - Scarlet and Green on Yellow. 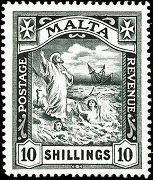 Between 1915 and 1919, the Valletta Harbor pictorial design of 1901 was re-issued as a 4 P. denomination stamp, the 2 1/2 S. Melita design of 1899 was re-issued, and a new version of the 10 S. Saint Paul design of 1899 was issued. These three new stamps were engraved on paper with WMK 3 - the Multiple Crown and CA watermark. 4 P. (1915 - Scott #63) - Valletta Harbor. 2 1/2 S. (1919 - Scott #64) - Melita - The Allegory of Malta. 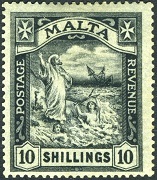 10 S. (1919 - Scott #65) - St. Paul Shipwrecked at Malta. The new 10 S. denomination has a completely different frame than that of the 1899 10 S. denomination, with the words "POSTAGE / REVENUE" added at the sides. With WMK 3, this is the rarest Malta stamp. Only 1,500 of them were originally printed, and of that number, only a very small percentage of them probably survive to this day. Per the 2018 Scott Standard Postage Stamp Catalog, a mint hinged example is $3,500, a used example is $4,400, and a mint hinged SPECIMEN is about $1,000. A used example, with a revenue cancellation catalogs only $85, but in searching the internet, I was unable to locate any examples with revenue cancels. During 1921, a new paper watermark was implemented, leading to the re-issue of the 1914-1919 denominations shown above. These re-issued stamps were printed on paper with WMK 4 - the Multiple Crown and Script CA watermark. 1/4 P. (1921 - Scott #66) - Brown. 1/2 P. (1921 - Scott #67) - Green. 1 P. (1921 - Scott #68) - Rose Red. 2 P. (1921 - Scott #69) - Gray. 2 1/2 P. (1921 - Scott #70) - Ultramarine. 6 P. (1921 - Scott #71) - Dull Violet and Red Violet. 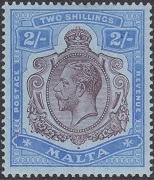 2 S. (1921 - Scott #72) - Ultramarine and Dull Violet on Blue. 10 S. (1921 - Scott #73) - Black. 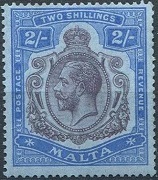 On April 15, 1922, some of the 2 P. denomination Malta stamps of 1921 were overprinted and re-valued to One Farthing. An example is shown above. 1/4 P. on 2 P. (1922 - Scott #97) - Gray. 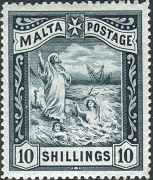 The two watermarks used for the stamps of Malta, from 1914 through 1922, are illustrated above. They will be referred to by their watermark numbers in the text descriptions. 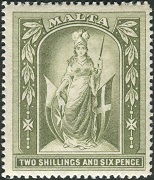 In 1918, the government of Malta levied a war tax on letter mail, in order to collect money to defray the costs of World War I. For this purpose, definitive Malta stamps were overprinted "WAR TAX" (Scott #MR1-2), as shown in the illustrations above. For a given period of time, the use of these tax stamps, in addition to the stamps paying the postal rates, was mandatory on all letter mail.